The stars were shining brightly on Sunday, February 8! The Settlement Home for Children recognized 38 high school juniors as the 2015 Community Youth Council and Nancy Nash Harper as the Community Leadership Award recipient at this year’s Shining Star Gala on February 8. 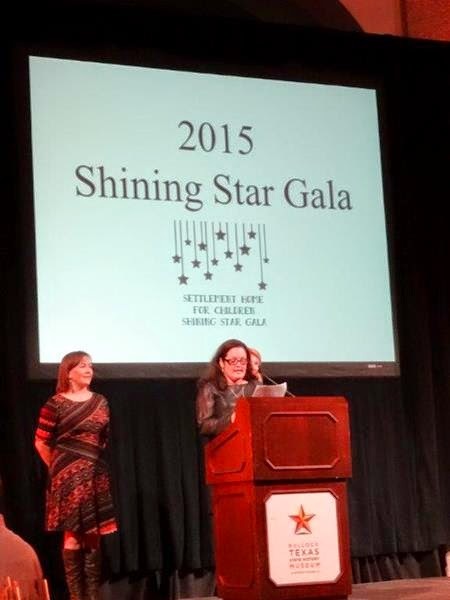 Formerly known as SpringFest, the Shining Star Gala was held at the Bob Bullock Texas State History Museum. This event highlights the achievement of Austin-area youth, who have committed to donating their time and efforts as volunteers with The Settlement Home. These teens help with the annual Charity Garage & Estate Sale, as well as work on special projects at The Settlement Home. Through this program, The Settlement Home hopes to instill a love for volunteerism and community in tomorrow’s leaders. Nancy Nash Harper of Capitol Chevrolet was selected as the 2015 Community Leadership Award recipient because of her many generous contributions to the Austin community. Harper has served on numerous boards and has helped fund critical programs in many non-profits. The gala was co-chaired by Brenda Jones, Laurie Maccini and Lissa Whitehurst. Ed Clements, KLBJ talk show host, served as the Master of Ceremonies. The John Arthur Martinez Band performed live and a gourmet buffet was catered by Rosemary’s Catering. Attendees bid on unique items in the silent auction, including airline tickets and vacation packages. All proceeds from the Shining Star Gala go to The Settlement Home for Children. Next post: Why Not You? Why Not Adopt Through Foster Care?